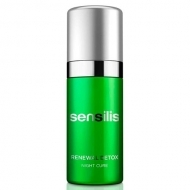 Regenerates and detoxifies the skin. 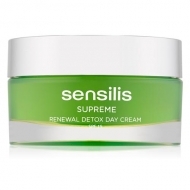 DESCRIPTION: Supreme Renewal Detox Day Cream from Sensilis is a regenerative and detoxifying nightly treatment formulated with active ingredients carefully selected for its protective action on cutaneous stem cells, as well as for its restorative, moisturizing and soothing power. It fights intensely against the signs of the passage of time and gives the skin a younger and healthier appearance. Its light gel-cream texture provides immediate freshness and comfort. Apply at night on face, neck and neckline, massaging until completely absorbed.